Tonight, I’m grilling out. I’m grilling a “BurgerBurgerBurger” (said with excitement and sometimes jazz hands). I’ve discovered that I can make a really delicious burger. To please A, I will try to buy ground beef that comes from farms where cows live happy lives (he’s vegetarian). 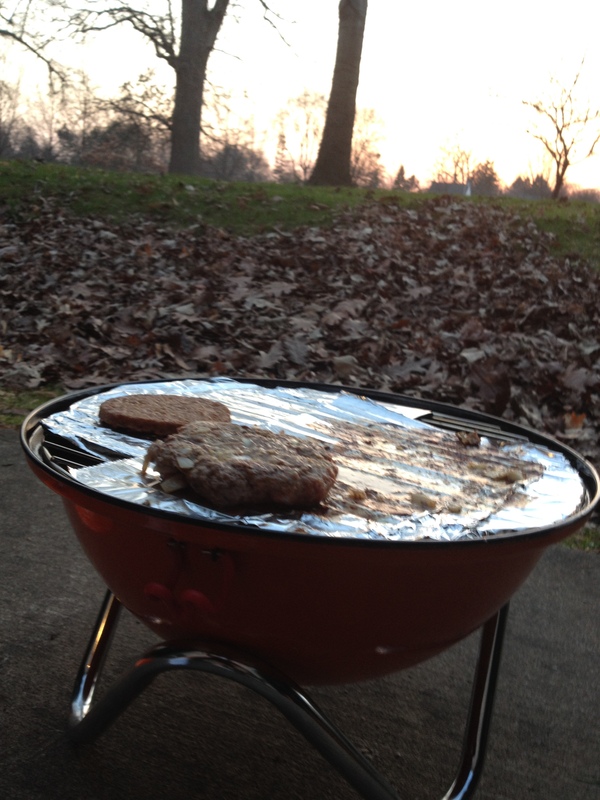 Then, I make burgers using a recipe similar to meatballs, and A and I will sit with a beer or a glass of cream soda, depending on the evening, and watch the sun set as my meat-burger and his veggie burger sizzle on our little grill. You can smell the bits of onion cooking in the burgers on the grill, and watching it all cook in front of you makes you salivate to contemplate the juicy (and in my case, well-done) burger in front of you. Have I mentioned that I don’t often get to eat burgers, unless my dad makes one for me or I make one for myself? (Aside: my father is truly the grill master, shoveling out through snow to the grill in the wintertime. I aspire to grill at that level). Because of cross-contamination on grills, burgers are not a safe choice for me at restaurants… which is why they have become so exciting to me at home. In a bowl, mix up ground beef (85% lean works well) with ½ a yellow onion, diced. Add a healthy shake of bread crumbs, 1 egg, and a few shakes of oregano, basil, garlic, and then add one more shake of garlic for good measure. Mix it all up and then form patties roughly the size of your palm. Go outside to put your burgers on the grill, and take a minute to enjoy the summer evening as they cook. If I make this a cheeseburger, does the cheese also need to come from happy cows?